In my work, I create environments or formal events where opposing behaviors can coexist and interact. For Basics, I have created two, site-specific installations to convey these dualities. A large, wall-sized soft sculpture is suspended across the corner of the space creating an overwhelming presence as it trumps the scale of the viewer. This raw canvas piece is comprised of three geometric shapes, which generates a larger nonobjective pattern. 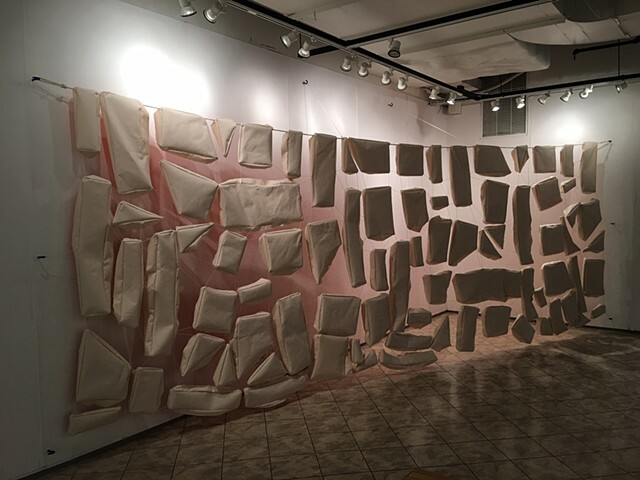 Dually reminiscent of a patchwork quilt and a cobblestone wall, ­­­By Piece, acts as a membrane that allows you to see the gallery wall between its vacancies, but you cannot step behind it. Rousing optical tension, the piece radiates vibrant color onto the stark white walls, as the backside of the sculpture is painted with bright orange. In opposition to the sagging By Piece, Pieces contains three taut canvases that are stretched and tightly bound to ultramarine-blue eye hooks fixed to the gallery wall. Among these works, I am exploring relationships between the rigid and lax, singular and plural, organic and artificial, in addition to the viewer and space. When sewing the cloth shapes in my work, my intention is to produce a controlled and clean experience. After these pieces are hung, their flexible materiality allows them to produce new forms, which generates tension between the soft and the structured. Each object is not only the result of a geometric structure applied onto canvas and string, but it is also evidence of a behavioral autonomy in industrially produced materials I wish to reveal.